This high quality Rutland chimney brush head by Master Sweep features a round brush head. The overall diameter is 9 inches. The connector is the newer TLC-style torque lock. The bristles are made of wire and are round, tough and durable. The bristles are oil coated and evenly distributed to give a uniform feel and cleaning. 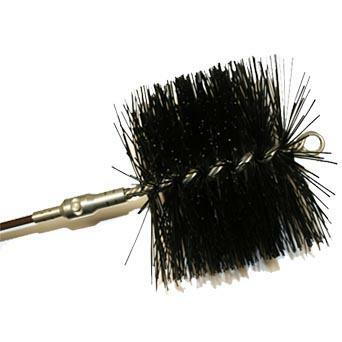 The professional quality of this Rutland 9 inch master sweep wire brush will clean thoroughly and be able to withstand the heavy use and abuse of professional chimney sweeps.